Gil Propp, Producer of Streetcar Tracks and Webmaster of bostonstreetcars.com, posing in front of Mattapan PCC #3262, an original "Postwar" PCC, while filming Streetcar Tracks in Mattapan Yard. I am a Civil Engineering undergraduate student currently studying at McGill University in Montreal, QC, Canada. I spent the first 18 of my life in Boston, living in Brookline between the C and D Branches of the Green Line. I return to Boston regularly to visit, to research the city's urban development history, to photograph the city for articles and to give urban development tours. 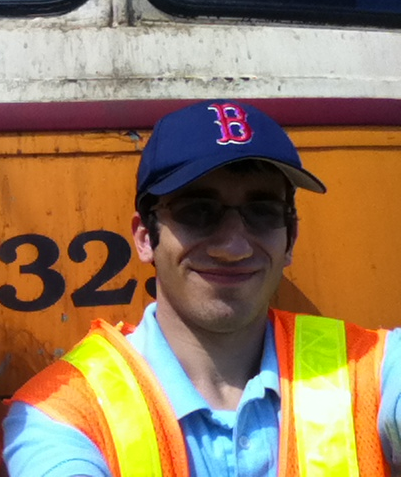 My strong passion for Boston Transit and the history of the city comes from years of riding the MBTA, as well as my natural inquisitiveness and strong attention to detail. As a child, I would notice odd, disused resources around the city and within the MBTA's coverage—old tracks in the street, old trolley poles on the sides of street and unused tunnels and platforms around the subway—and wonder why they were still there and what made the rest of their kind disappear. To make a long story short, my interest in the MBTA's history inspired me to create my documentary film Streetcar Tracks as my senior project at Gann Academy in Waltham, MA (my high school) and strive to unearth the history of Boston's transit and how it has changed over time. Through producing Streetcar Tracks, I have grown very interested in the history of the civil infrastructure of Boston at large—how the city developed over time, where significant centers of the city once were and what motivated the city to change. Bostonstreetcars.com is the product of that interest, my outlet where I can share my research in a widely-accessible form. There has been no turning back since I started this website—there are many more areas I feel I must research, many more remnants of Boston's transit history that I must discover and bring to light, many more trends in Boston's history I must explain. Topics for my articles and tours are both calculated and random. There are some places in Boston and areas of the MBTA's system whose history has always intrigued me, and there are many more articles about such topics that I intend to write. Other articles come to me suddenly—whenever I return from Montreal and pass along the streets of Boston, I am on a constant lookout for remnants of old transit or commercial infrastructure. When something catches my eye, I make a mental note to research the area and write a bostonstreetcars.com article about it.